California-based Catalina Pacific® has been selected by Heavy Duty Trucking (HDT) as one of the nation’s “Top 25 Green Fleets for 2018”. 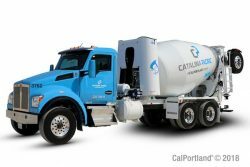 A CalPortland company, Catalina Pacific commissioned 118 new “Near-Zero Emission” CNG/RNG powered concrete mixer trucks that were placed into operation in the fourth quarter of 2017. In the HDT November 2018 journal, HDT indicates that they look for long-term dedication to sustainability, but also pay close attention to new initiatives for inclusion in their Top 25 Green Fleet class. HDT also looks for companies that are leaders in their industries promoting fuel efficiencies, alternative fuels while testing new technologies. Catalina Pacific’s “clean fleet” vehicles refuel at company owned and operated CNG/RNG stations (built by Ozinga Energy) utilizing RedeemTM by Clean Energy® which is a renewable natural gas (RNG) fuel made entirely from organic waste. The fuel is derived from biogenic methane that is naturally generated by the decomposition of organic waste at landfills and agricultural waste sources. Catalina Pacific is building privately owned fueling stations at two plant locations.